In 1994 a Kurdish shepherd in eastern Turkey discovered something while tending his flock: the tops of a series of buried stones. News of his find reached museum curators several miles away and ultimately made the site at Gobekli Tepe (pronounced "Go-beckly Tepp-ay") the subject of a full-blown archaeological survey. 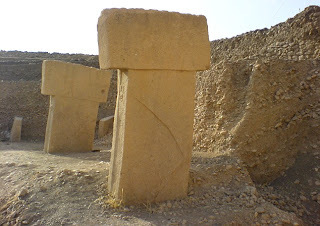 Now, almost fifteen years later, Gobekli Tepe is being hailed as one of the greatest historical finds of the past half century, with some even calling it the "most important archaeological site in the world". The stones unearthed thus far are intricately decorated with carvings of humans and animals. Evidence indicates that many more stones are waiting to be uncovered. And then there is the age of the buried structures: calculated to be around 12,000 years old. That's approximately ten thousand years older than Stonehenge in Britain or the pyramids of Egypt. Little wonder then that more than a few are likening Gobekli Tepe to the biblical Garden of Eden. Mash down here for an in-depth article from The Daily Mail, with a lot more photos of those curious stones at Gobekli Tepe.